"Muhammad Ali: His Life and Times". 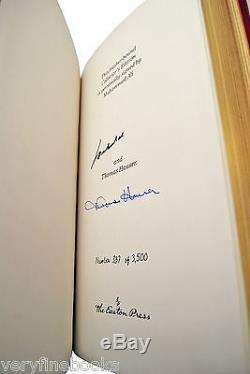 Signed Limited Edition #337 of only 3,500 (Very Fine). In the words of the great Muhammad Ali. Success is not achieved by winning all the time. Real success comes when we rise after we fall. Some mountains are higher than others. Some roads steeper than the next. There are hardships and setbacks but you cannot let them stop you. Even on the steepest road you must not turn back. 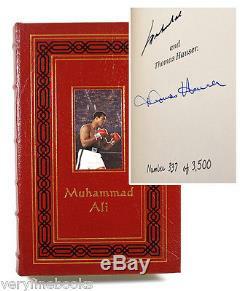 The perfect gift for the collector of rare autographed sports books. 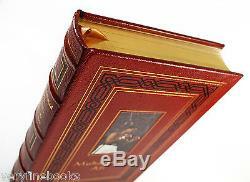 A luxurious leather bound collector's edition, published by Easton Press and. Personally hand signed by "The Greatest", Muhammad Ali. A gorgeous dark red leather Numbered Limited Edition, also signed by the author, Thomas Hauser. Limited to 3500 signed & numbered copies. Illustrated with numerous historic black & white photographs. Very Fine without any flaws. No blemishes or scratches to gilded page edges. Includes extra unattached bookplate for your own personalization. Ali was the first man to win the heavyweight title three times and he revolutionized the sport of heavyweight boxing. In 1990, Muhammad Ali was introduced into the International Boxing Hall of Fame. 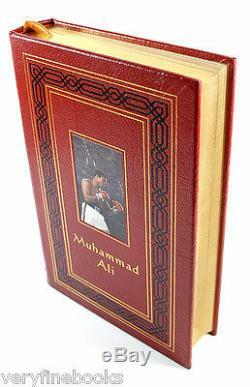 Widely regarded as one, if not THE, best heavyweight fighters who ever lived, Ali's biography is an important book signed by an important world figure. As Cassius Clay, Ali won the light heavyweight gold medal at the 1960 Olympics and began the road to a highly successful heavyweight career. In 1964, Ali surprised the world by beating Sonny Liston and after the fight he changed his name to Ali after adopting Islam. Ali's title was stripped from him in 1967 when Ali refused the draft but he regained it, eventually, in 1974 by beating George Foreman. Ali successfully defended his title several times until the early 80's when his career was over. 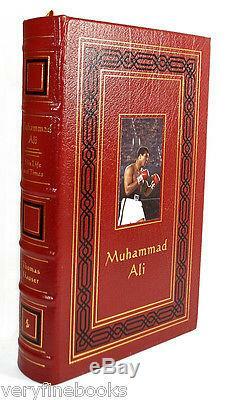 A detailed, if hagiographic, account of Ali's public career and private life. 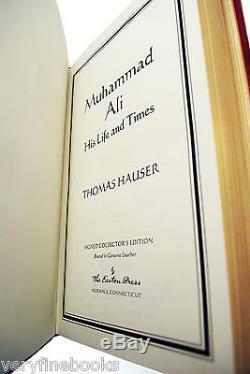 Hauser (author of one of the best books ever on the fight game, 1985's Black Lights) is an obvious and uncritical fan of Ali's, whom he apotheosizes early on as the most recognizable person on earth.' In aid of what might be called oral biography, Hauser draws on over 200 sources--acquaintances, associates, opponents, friends, enemies, blood relations, and celebrity observers of the sometime title-holder--to create a composite portrait that's longer on sympathetic assertions than reflective insight. 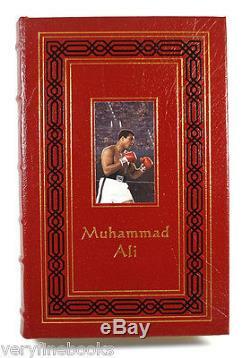 The ranks of the commentators include the oddly coupled likes of: Cassius Marcellus Clay, Sr. (Ali's dad); Joe Martin (the Louisville cop who taught Ali to box); Olympic teammates; Atallah Shabazz (the daughter of Malcolm X who helped convert Ali to the Nation of Islam); trainer Angelo Dundee; Jimmy Carter; Leon Spinks; George Plimpton; Sylvester Stallone; referee Arthur Mercantee; Chuck Wepner (a human punching bag widely known as ``The Bayonne Bleeder''); and Carl Walker (the black assistant attorney general who tried to make the federal case against Ali for draft evasion). Overall, Hauser does a good job of marshaling a wealth of facts into a cohesive whole and providing behind-the-scenes glimpses of a ring lion in the autumn, if not winter, of his years. Throughout, however, the author makes almost no attempt to conceal the genuine regard and admiration he feels for his subject. A walkover for Ali but a disappointment for those with even a passing interest in the sweet science's grittier realities. 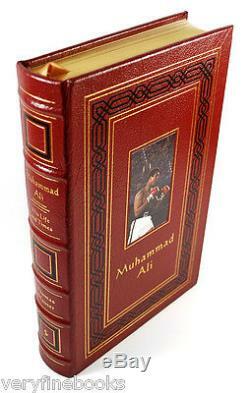 The item "Easton Press MUHAMMAD ALI His Life Times Signed Limited Edition Leather Bound" is in sale since Thursday, January 03, 2013. This item is in the category "Books\Antiquarian & Collectible". The seller is "veryfinebooks" and is located in East Kingston, New Hampshire. This item can be shipped worldwide.